It’s a fact, older windows leak and are inefficient. The most expensive windows you’ll ever own are the ones in your home right now. Wood, aluminum and composite windows can crack, warp and leak. Our vinyl windows offer durable, dependable performance, are low maintenance, resist fading and discoloring with age. 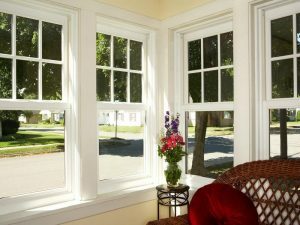 Vinyl replacement windows also offer heat, cold and sun protection. We apply double low-E coatings to the glass and infuse argon gas into the space(s) between the glass panes. The argon gas acts as an insulator, working in both summer and winter to keep interiors protected from outside temperatures, eliminating those heat and cold spots in your home as well as providing some blockage of UV rays. Argon gas-filled windows also help reduce condensation on windows, which increases the longevity of your home. Low E is a clear window coating of invisible metal or metallic oxide, applied to both sides of the glass in dual-pane windows that filter the sun’s energy in the summer, keeping your home cool and comfortable by rejecting the sun’s heat and damaging rays and it keeps your house warmer in the winter by reflecting certain segments of the sun’s light spectrum back into the home. These Low-E coatings allow visible light through but block heat-bearing and fabric-fading portions of the solar spectrum. Best Buy Windows are AAMA Gold Label Certified, NFRC certified and Energy Star certified. What does all this mean? AAMA certified means our windows have meet stringent performance standards for air leakage, water penetration and wind pressure, and that those tests were conducted by an independent AAMA accredited lab. Individual components used in the window and door have passed their own separate performance test in order to be eligible for use in AAMA certified window or door. Our manufacturer’s plant production lines, component inventory and quality control records are checked annually through two surprise inspections by an independent third-party validator. NFRC is a non-profit organization that administers the only uniform, independent rating and labeling system for the energy performance of windows, doors, skylights. When you see the NFRC label on these products, this is your assurance that it’s going to perform as advertised. Energy Star is a government backed program designed to protect the environment through superior energy efficiency. Energy Star qualified windows are independently tested to perform at levels that meet or exceed strict energy efficiency criteria set by the U.S. Department of Energy. At Best Buy Windows and Siding, you pay for quality, not a name!